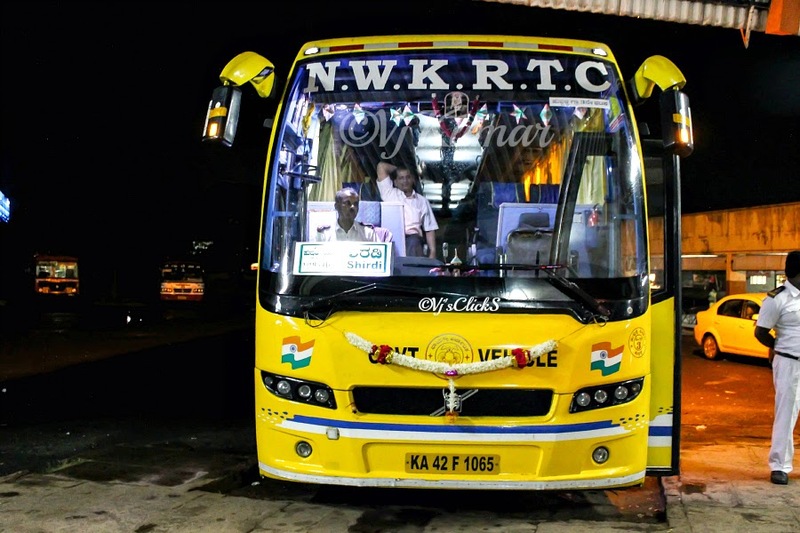 NWKRTC previously operated Airavat Gold Class (53 seats) and Express services to Shirdi and very recently introduced non a/c sleeper services. But then NWKRTC began to add seats with Calf support and renamed the service as Club Class. 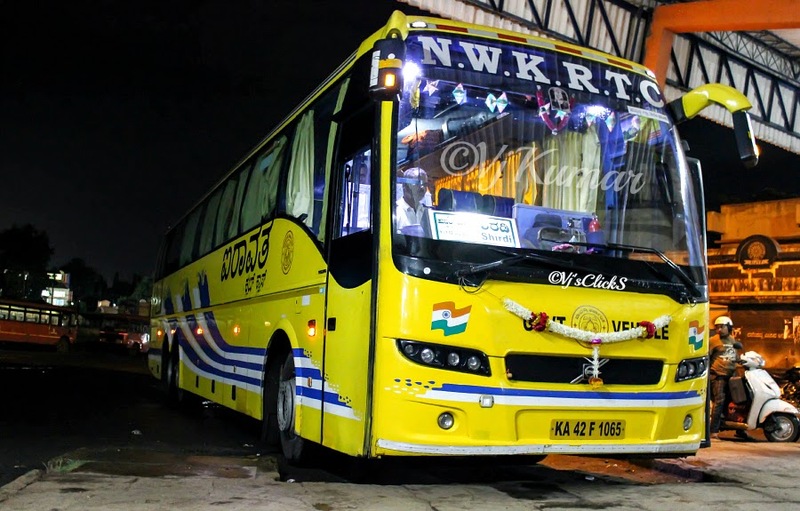 Though I had travelled in NWKRTC Gold services before, this was the first time I was trying the Moff-3, Hubli division bus. After enjoying an eventful day in Hubli, thanks to Prashant Kallimath and his family for their hospitality it was time to board the bus. We had booked the front row seats weeks ago to ensure not to miss any part of the journey. The clouds opened up as we headed to the depot and moderate showers began as the bus was getting ready in the depot for departure. With the intensity of the rain increasing by each passing minute we decided to find solace in the warmth of the Club Class as she began to make her way out of the depot. 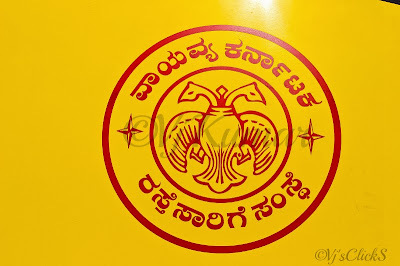 We were seen off by depot officials and we headed towards our first pick up point, Hubli Old bus Stand. We reached the Hubli Bus Stand by 19:50hrs and made our way to Platform. The bus was running almost 90% full with pockets of passengers boarding from Dharwad and Belgaum. While the crew enjoyed a small tea break, passengers began to settle down for the journey up ahead. At 20:05hrs, we began to pull out of the platform and headed out of the bustling bus stand. Our next stop was the new bus stand. The evening traffic with rains was testing the skills however Mr Kundgol was up for challenge as he drove the bus effortlessly and reached new bus stand in no time. We began to leave immediately and headed out of the bus stand. Fatigue was finally catching onto me as I slowly shut my eyes down. I woke up in Dharwad and got an opportunity to meet Mr. Shashidhar, DTO NWKRTC Hubli Divison. After a brief discussion, we resumed our journey and so did my sleep. I vaguely remember waking up at Belgaum bus stand and at Ramdev. We finally pulled over for dinner. While I insisted to continue my sleep, Prashant and Deepak forced me for dinner. Thanks to Prashant again for the home made food, my stomach was full and was eager to resume my sleep. No sooner we joined the highway; I decided to resume my sleep. I made my way to the rear of the bus as the seats at the rear, next to the Emergency exits were empty. I made myself comfortable as the blast of cold air from the air vents put me back to sleep. The last thing I remember seeing out of the window was the Canara Pinto 2nd service heading towards Mangalore. When I woke up we had passed Swargate and had pulled over for a tea break. The crew change happened here and we resumed the journey and again I resumed my sleep. The comfort and ride quality was very smooth. The next thing I remember was waking up to the honking of SVR B9R which was ahead of us desperately trying to overtake a truck. We pulled over for the final break at Ahmednagar. After a 20minutes break, we resumed our journey. I decided to take over my favorite seat at the front as Mr Kundagol skilfully drove the bus on busy highway. We overtook the APTDC ‘s single axle merc when it had pulled over for a break. The traffic started to slowly build up as we neared Shirdi. This was expected considering it was a weekend. We reached Holiday Park, the last stop of our journey at around 8:10am. Will I try this service again? I am not very sure if I will be trying this service again as I usually take the direct D-4 buses of KSRTC to Shirdi. 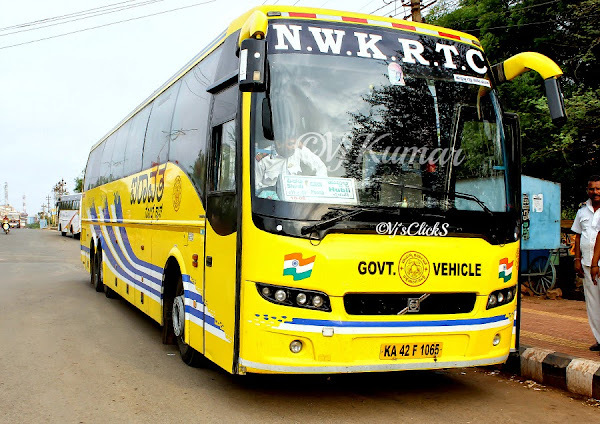 However, nothing can take away the service NWKRTC provides to its passengers and this was one such service. The bus had done around 5.2lac kms on the Odo and was very well maintained. Comfortable seats with calf support ensured better leg space. Needless to say but hats off to the crew who were very friendly and ensured their passengers had no hassles at any point of the journey. And as for me, well it was an experience I will be cherishing for a long time to come. Thanks for sharing a nice blog.